Easy to make creamy roasted butternut squash and almond soup. Perfect for a cold winter’s day to warm you up. It’s very mildly spiced so if you like your curry I would recommend doubling all the spices. 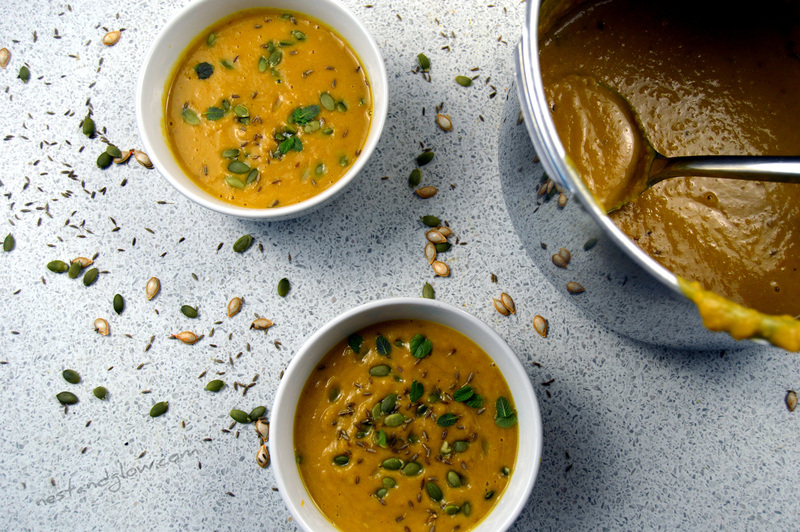 This butternut soup recipe is suitable for plant-based, vegan, oil free, dairy free, gluten free and healthy wholefood diets. Full of nutritious vegetables and heart-healthy nut fats. Roasting a butternut for soup may sound like a lot of work and difficult, but like all of my recipes it’s pretty easy. Simply cut the butternut in half and then roast for an hour. Then when it’s done scoop out the flesh and simmer. It’s actually less work than peeling the squash and roasted butternut tastes great. You can get on with other tasks while the oven is doing the work. If you don’t have a butternut squash you can replace it with any other pumpkin or squash, just remember to try to add the same amount of flesh that is found in a butternut. I don’t add any oil to this when roasting the pumpkin/squash as high temperatures destroy the goodness in the oil and there really is no need for it. Roasting a watery squash in its own juices tastes delicious. I use almond butter for this one, but any nut butter works really well such as peanut or cashew. The nut butter makes this dairy-free soup rich and creamy while also adding fat and protein. The fat in the dish is said to help with the absorption of turmeric. I tend to add a pinch of turmeric to everything savoury I make as it has health benefits that are not yet fully understood. Scientists are apparently in labs trying to isolate the compounds that have health benefits. While they are doing that we can just add turmeric here and there to our dishes for extra colour, nutrients and vitamins. You can use shop bought stock to make this butternut soup if you like, but I prefer to just boil a carrot, an onion, a stick of celery, a few bay leaves and salt and pepper in a pressure cooker for 10 mins. This makes a fresh stock that does not have any flavour enhancers, solid oil or other nasties. Remember to use veg that is past its best and keep the skin on the onion for more flavour and colour. If you don’t have a pressure cooker you can simmer gently with the lid on for an hour. On days when I’m short of time, I use miso as a stock. If you want to make this butternut soup a more filling and complete meal then you can stir in some cooked pulses or beans. Lentils and chickpeas work really well to add protein and carbohydrate. Don’t worry if you get a few squash seeds in the butternut soup, they are delicious, nutritious and similar to pumpkin seeds. Although they are in a tough shell once the soups blended this is broken up and helps to up the fibre content of the dish. Cut the butternut in half, no need to remove the stem, scoop out the seeds and dry bake (no oil needed) for 1 hour at 450 F / 230 C. Check half way through that it isn’t burning. Scoop out all of the butternut flesh. Don’t bin the skins they have lots of nutrients and can be placed back in the oven for a chefs treat. Peel and dice the onions and garlic. Then cook on a high heat with a dash of water for 5 mins until translucent. Add everything else and simmer for 5 mins then take off the heat, blend and serve. 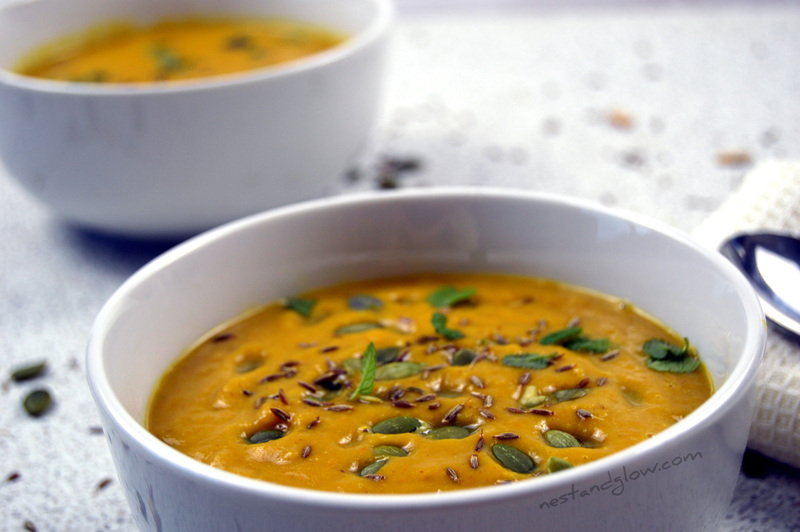 Sprinkle butternut soup with pumpkin and cumin seeds for extra flavour and crunch. Enjoy immediately. Every recipe I have tried of yours has been amazing! Thank you! My boys have no clue they are eating black beans in chocolate cupcakes! I love it’s gluten free and dairy free. (Celiacs) Thank you for making yummy desserts which I can eat and share!! It means a lot.